May brings more growth. 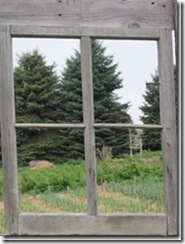 These photos are from the Hager garden at Windbeam Farm. Friends share their land with me in return for a year’s worth of garlic eating. Not a bad trade, huh? Paul made a window of opportunity. Check out their website on the side. Great place for weddings and gatherings. 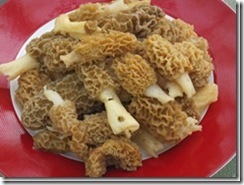 May also brought morels and spring garlic. Both grilled to perfection by Tyler. Spring Garlic is garlic that came up from last year…perhaps didn’t get harvested and wintered over. It’s a nice treat this time of year. 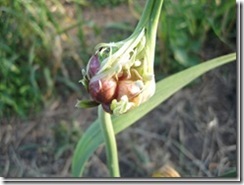 Then comes the season of scapes—the flower shoot of the hardneck garlic. We had an abundance this year. Sold them at the Red Wing Farmer’s’ Market and gave to friends. 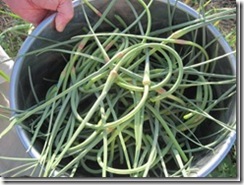 Scapes hold us over until the real thing is ready to eat. There are many philosophies on when to break the scapes off. I tend to harvest them when I see them. If kept on, they tend to make for a smaller bulb of garlic. You want the energy of the plant to go to the bulb underground and not the flower of the scape. And make sure you eat them and not just compost them. 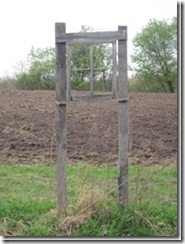 The scape tends to straighten itself out and the bulbil will open. All varieties are unique in the shape of their scape, their curl, and the size of their bulbil. We have had plenty of rain in Minnesota this summer. The garlic and the weeds have grown tall and beautiful. Harvesting has been a challenge in dodging the rain. Ideally, one doesn’t want rain for the two weeks or so prior to harvest. No luck with that this summer. But the garlic is beautiful. The Inchelium Red got up to four inches! 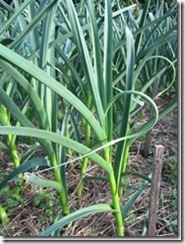 Garlic has got to “cure” for 2-3 weeks in order for it to dry and develop the garlic taste we have all grown to love. This is also weather dependent as the more humid it is, the longer it takes to dry. Make sure you don’t have the garlic hanging in sunshine. You want air flow and no light. That is often easier said than done. Our garage gets taken over. 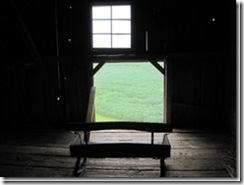 This is the barn on The Farm of my brother and sis-in-law. The hanging garlic is kept out of direct light yet has air flow. Each twine is holding about a dozen garlic. Keeping track of the varieties is a task in and of itself. Each twine has a label with the name of the garlic and color coded to show whether they are for sale/give away or if they shall be replanted. 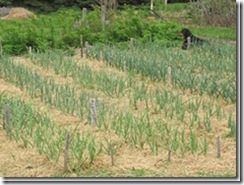 What a treat it is to grow garlic on two beautiful farms. This is my favorite place on The Farm. I’ll sort my garlic while taking in the view and the breeze and the solitude.